- Capacities starting from: 200 LPH To 2000 LPH. We are offering Batch Pasteurizer to our client. 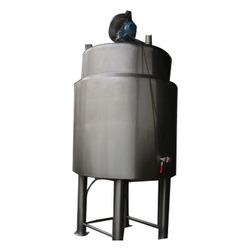 We manufacture Vertical / Horizontal Insulated Stainless Steel storage Tanks with Dimple Jacket suitable for circulation of steam / hot water / Cold water. 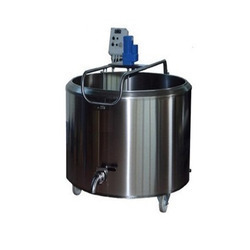 The batch pasteurizer is manufactured from Stainless Steel SS 304 is suitable for working at maximum 6 Bar with Test pressure of 9 Bar . We offer Batch pasteurizer, ranging in the capacity of 300 liters to 1000 liters. These are designed to pasteurize and process various dairy products. We develop these materials in European safety standards and CE requirements and according to 3-A sanitary standard requirements. The different dairy products that are pasteurized in this machinery include cheese, yogurt, cream and ice cream. Batch pasteurizer - electrical with 40 kw heaters to heat milk from 4 to 80c in one hour for pasteurization. We are offering Batch Pasteurizer to our clients.